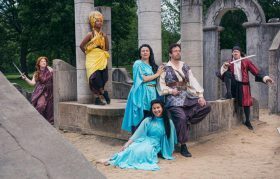 A Company of Fools’ production of The Amazing Adventures of Pericles, Prince of Tyre breathes new life into a Shakespearean classic – and perhaps even a couple ill-fated characters along the way. Directed and adapted by Catriona Leger, the play follows the antics of young Prince Pericles of Tyre. Pericles performs feats expected of a man of his status: solving riddles revealing incestuous monarchs, jousting to win the love of a princess, and embarking on fearsome voyages at sea. But it’s with the show’s innovation that its entertainment value skyrockets. With additions including Corn Pops as sustenance for a country in midst of famine and jabs at OC Transpo, A Company of Fools’ gives Shakespeare a modern edge. The many clever stylistic modifications more than warrant the subtle title change. Personally, the highlights were the sea journeys. Portrayed by two actors holding large cut-outs of waves, another wearing a hat artfully adorned with a ship, and another wielding a spray bottle, these scenes consistently drew big laughs. Little strokes of innovation like this are everywhere, from the colourful costuming to the use of cardboard cut-outs. The interactivity of the show additionally gives it a unique edge. Breaking the fourth wall and interacting with audience members works very well with outdoor theatre and makes the experience an even more immersive and pleasant one. Despite its goofiness and absurdity, my interest did wax and wane a little during the first half, largely because of the confusion of a revolving door of characters, all played by the same six actors. While they are well-differentiated by costumes, props and accents, it’s difficult to become acclimatized to one character before it’s replaced by another. Or perhaps it is simply the eccentric writing – a popular theory is that the first portion of the play was penned by a comparatively mediocre writing companion of the Bard. This troupe of actors is very strong and multi-talented, with more than one thespian exerting their musical skills either on the drums, violin or guitar. More than that, the vocal interludes are lovely – most notable would be Jennifer Cecil, whose vocal prowess is sublime. Also worth noting are Pierre Brault, who is hilarious in any of his various roles, and Al Connors as Pericles, whose tantrum of grief following news of the death of a loved one was one of the funniest slapstick moments of the show. This adaptation of Pericles, A Prince of Tyre is both a wonderful show and a pleasant summer outing. Accessible, light-hearted and simply fun for all ages – I highly recommend seeing this production. But that’s just my opinion and I’d love to know what you think. Were you baffled by the character changes? What were your personal highlights? Join the discussion and let me know in the comments below. The Amazing Adventures of Pericles, Prince of Tyre runs through August 20th at various parks around the city. Visit fools.ca for all the information including the full parks schedule.